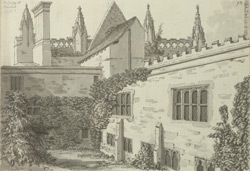 Newstead Abbey passed to the Byron family in 1539 when Henry VIII dissolved the monasteries. At the time of Grimm's visit the fifth Lord Byron - or the "wicked" Lord as he was also known - presided over the estate. One evening, whilst dining in London with other wealthy Nottinghamshire landowners, he got into a dispute with his neighbour William Chaworth. The Lord, notorious for his volatile and unpredictable temper, challenged his friend to a duel, drew his sword, a scuffle ensued and Chaworth was mortally wounded. As a peer of the realm Byron exerted his right to be tried by the House of Lords. He was found guilty of manslaughter but escaped serious punishment by claiming protection under a legal loophole "benefit of clergy".